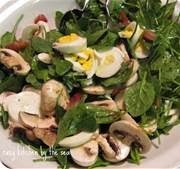 In a large salad bowl gently toss the spinach, onion rings, eggs and mushrooms; set aside. Combine all dressing ingredients in a pint jar and screw the lid on tightly! Pour this dressin over the salad immediately before serving. Sprinkle the crumbled bacon over the top.